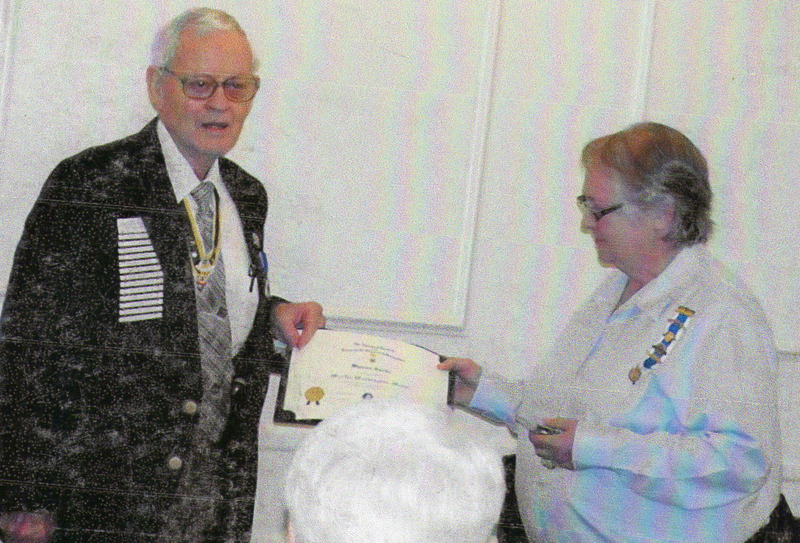 On behalf of the Harry S. Truman Chapter, Registrar / Genealogist David McCann presented the Martha Washington Medal and Certificate to Sharon Carter of the Sarah Lewis Boone Chapter on March 19, 2011. As a recipient of the Martha Washington Medal in recognition of outstanding service to SAR, Sharon Carter provided five new SAR applicant names that have since joined the Sons of the American Revolution. The medal is gold in color and bears on the obverse a portrait of Martha Washington within the inscription "SAR Martha Washington Award." It is suspended from a chest ribbon of the SAR colors and is accompanied by a certificate which should be engrossed and presented with the medal. On behalf of the Harry S. Truman Chapter, President Dirk A. Stapleton is shown here presenting Historian Brian Smarker the C. Lloyd Yohe Yearbook Award (First Place). As the Chapter Historian, Compatriot Smarker submitted the Chapter Yearbook at the 2009-2010 MOSSAR State meeting. Compatriot Smarker will file this certificate with the Yearbook. The Chapter would also like to recognize Compatriot Smarker’s efforts and dedication in completing the yearbook. 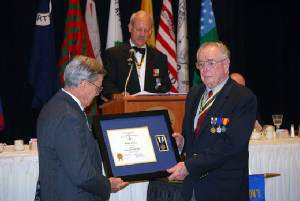 Pictured here is Compatriot Romie Carr being presented the Silver Good Citizenship Medal at the 2010 George Washington Birthday Celebration on February 20, 2010. The award was framed, and his brother Will Carr presented it to him during the GWBC. 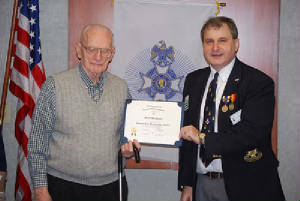 Pictured here is Compatriot Harry Dexheimer, receiving his 20 Year membership pin, at the 296th Harry S. Truman Chapter meeting on February 13, 2010. Compatriot Dexheimer joined the Harry S. Truman Chapter on October 22, 1988. 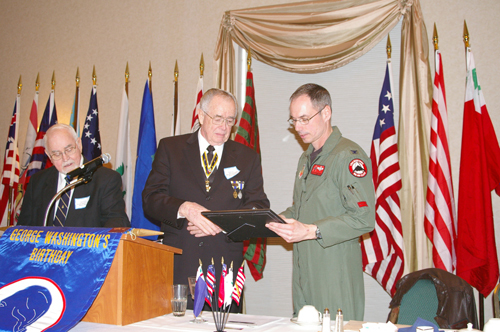 Pictured here is the guest speaker during the 22nd Annual George Washington Birthday Celebration on February 23, 2008, Colonel Greg Champagne, Vice Commander, 131st Fighter Wing, Missouri Air National Guard, St Louis. Colonel Champagne presented a program on the Air Force's premier weapon system, the B-2 bomber. Colonel Champagne is shown here receiving a Certificate of Appreciation, to be presented to the men and women of our fighting force at Whiteman AFB, MO from Compatriot Romie Carr, Chairman of the George Washington Birthday Celebration Committee. 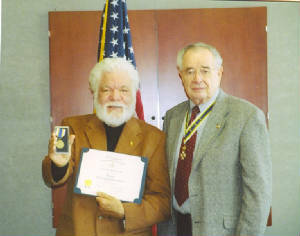 Pictured here is President Romie E. Carr during a presentation to Jimmy Allen Mickelberry, Sr., receiving the Bronze Good Citizenship Medal on February 10, 2007 in recognition of notable service in behalf of our American principle. 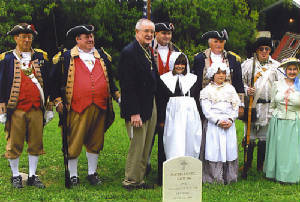 1) Harry S. Truman Chapter President Romie Carr and the MOSSAR Color Guard are shown in picture above at the Nathaniel Lewis SAR Dedication on September 17th, 2006. Also pictured here is Mrs. Cathy Owens, current National Librarian and Senior President of the Corps of Discovery Chapter of the Children of the American Revolution in Kansas City, MO. Also pictured here is Victoria Stapleton and Anna DeVenney who are members of the Corps of Discovery Children of the American Revolution. (L-R) Major General Robert L. Grover, MOSSAR Color Guard Commander; Captain James L. Scott, Rommie Carr, HST Chapter President; Dirk A. Stapleton, Victoria Stapleton, Anna DeVenney, Alvin L. Paris, Captain Russell F. DeVenney, Jr., MOSSAR 1st Vice President; and Mrs. Cathy Owens. 2) On May 29th, Compatriots Robert Grover and James Scott participated in the Liberty Memorial Day Parade and Memorial Service. Later, they also participated in the Independence, Missouri Parade and Memorial Service at Woodlawn Cemetery. 3) On April 29th, State Officers installed at the MOSSAR State Meeting from our chapter were William Hartman, Courtney Sloan, Treasurer; James Scott, Sergeant at Arms; and David McCann, State Genealogist. Congratulations gentlemen! 4) Also at the MOSSAR State Meeting, our nominee for State Teacher of the year, Mr. Peck was awarded the honor at the MOSSAR meeting. In addition, Carolyn Grover, wife of Robert L. Grover, was chosen as Woman of the Year. Congratulations to the both of them as well! 5) Courtney Sloan received the Meritorious Service Award from the chapter. He has already won this order before, so he did not get a medal this time. 6) Compatriot George L. DeLapp received a supplemental for Prince Sherman. In addition, on 05/12/2006 George also received a new grandson. 7) Jim Mickelberry, Sr. received a supplemental for William Grever. 8) Romie Carr has received two supplementals, one for Thomas Townsend and one for Edward Wade, Sr.
9) On April 4th, Compatriot Grover attended Election Day, Voting in uniform. 10) On February 24, Compatriot Grover attended the Leadership Meeting in Louisville, KY.
NSSAR Annual Congress HST sponsor National Rumbaugh Oration contest winner Micah Kubic.